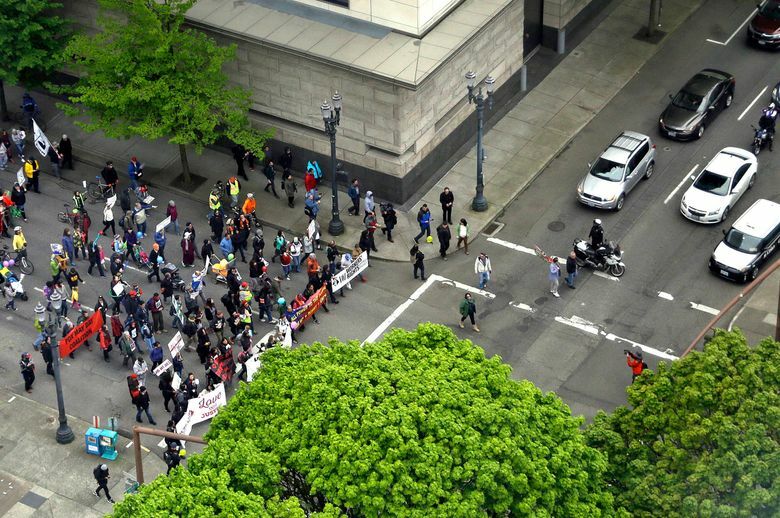 Violence marred May Day protests in Olympia and Portland. 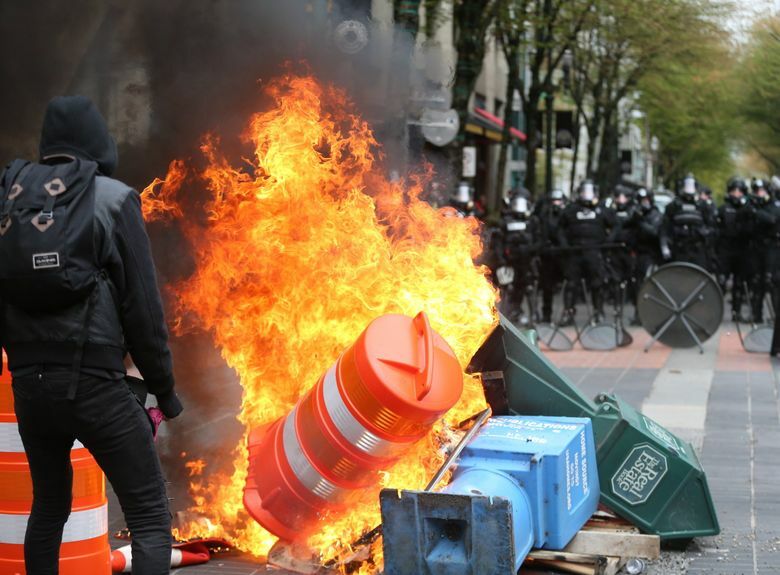 Demonstrators threw smoke bombs, Molotov cocktails and other items at police Monday in Portland during May Day protests, and storefront windows were broken during rowdy protests in Olympia. Portland police arrested more than two dozen people near Pioneer Square after a protest permit had been canceled “due to actions of anarchists.” Police say the protesters destroyed a police car, set several fires in the street, damaged storefront windows and attacked police. Component post 10364492 could not be found. Police described the group as “members of a mob” wearing masks and said they were firing rocks from sling shots as well as throwing bottles and using pepper spray. Police said they had deployed crowd- control devices. In Shemanski Park in Portland before the violence broke out, hundreds of people, including some families with children, gathered at a May Day rally and watched dancers in bright feathered headdresses perform to the beat of drums. Friends Marian Drake and Martin Anderson attended the rally earlier in the day and watched from a nearby park bench as they held balloons supporting the International Workers Union. “Things are so screwed up in this country. You’ve got a city right here that’s full of homeless people and you’ve got a president … whose budget is going to cut 40 percent to the EPA and end Meals on Wheels. We don’t like those kinds of things,” Anderson said. Elms, a teacher’s aide who teaches kindergartners how to read, said that it was his first political rally and march and that Trump’s election drove him to participate. “This is the first actual protest that I’ve participated in because this year, with the election, I was flummoxed,” he said. Several dozen people dressed entirely in black and wearing black bandannas and ski masks on their faces stood around the fringes of the Monday gathering at Shemanski Park holding signs that read “Radicals for Science!” and “No cuts! Tax the rich!” as police officers looked on.